Due to popular demand, The Hullabaloo is bringing back the Enchanted Forest! In September 2017, Roma Patel (cohort 2013) was awarded the Horizon CDT impact grant which allowed her to collaborate with the Mixed Reality Lab(MRL), and create the Enchanted Forest. 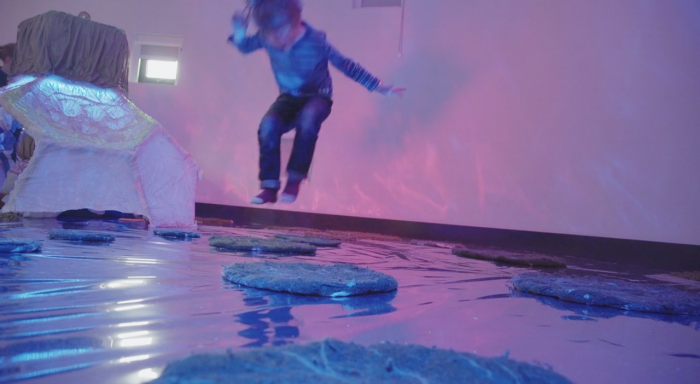 The Enchanted Forest is a theatre installation that incorporates digital technologies into the set design with interactive trees, flowers that light up, a lily pad that makes music, and story-telling trees. The forest is designed for children to sit and play in with their grownups. The installation originally opened at the Theatre Hullabaloo in December 2017, toured the Polka Theatre in 2018, and is now back at Hullabaloo from the end of March until November 2019 for many more visitors to enjoy. You can read more about Roma’s work here.